BSMS Track and Field: BSMS Girl's Sectional Champs! For the first time in the history of the BSMS track and field program (5 years), the girl's squad laid claim to the Bangor Sectional team title. It is the first sectional title for any of the three teams in track and field (prior to the tri-op) and the first sectional title for any girl's sport in Benton School's history. "We let it slip through our fingers last year (finishing second by 1 point), and one never knows if you will ever get another chance," exclaimed Coach Raley. "We performed just about as good as we could have, even being a bit short handed once again." 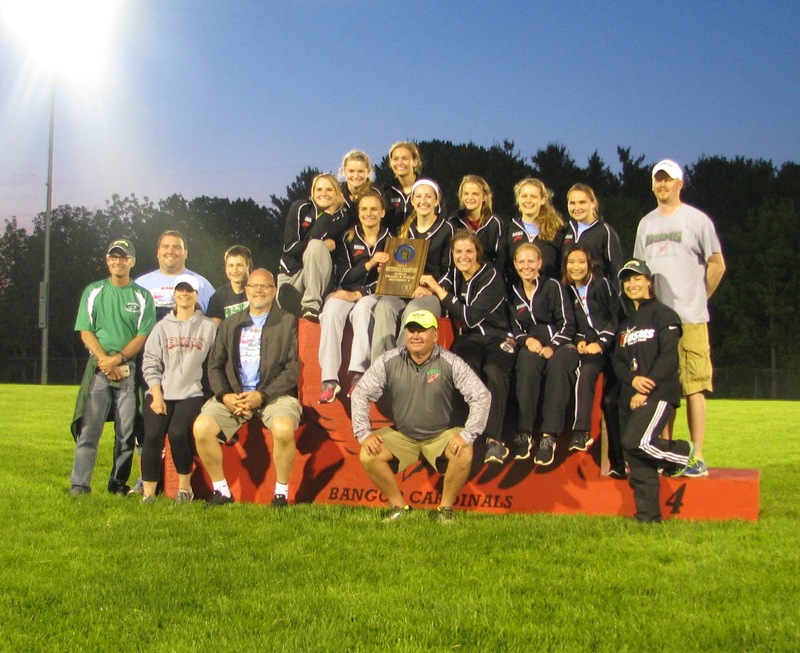 The girls scored 75 points ahead of runner up Cuba City (68) and third place, Cochrane-Fountain City (53). Probably one of the biggest moments of the meet came when alternate Katie Pingel literally dove to make the 2nd exchange with Cali Jerry, who in turn got the baton to Emma Lawrence, who at that time was in 5th place. Emma sprinted ahead, catching all but one runner (Cuba City's Mykenzie Vaassen) to finish in second place (51.602) and score a very valuable eight points for the Green and Red. Moving on to the state meet (top four finishes per event) for the girls are: the 4x100 relay (Murphy, Pingel, Jerry, Lawrence)(2nd place), Emma Lawrence (1st 100HH, 15.65, 1st 300LH, 46.73, and 3rd TJ, 34' 7"), Brianna Leahy (1st shot, 40' 8.5", 2nd discus, 124' 11"), Paige Murphy (3rd 100m, 12.94, 2nd LJ, 16' 4"), and Katie Pingel (4th TJ, 33' 1"). Emma's effort in the 100m HH set a new Tri-Op record. Also, Brianna Leahy's effort in the discus set new Shullsburg and Tri-Op records as well. Katie Pingel (100HH, 5th 17.01), and the girl's 4x800 relay 11:09.41, (Kruger, Greenfield, Notrott, and Pahnke) ran season best times but failed to move on. The boy's squad kept their composure down the stretch after a mishap in the 4x200 relay that cost the team a trip to LaCrosse. They bounced back and ran to a second place finish in the 4x400 (3:30.69). Team members are Aaron Pulvermacher, Troy Turpin, Ethan Shetler, and David Germaine. Three of the four 4x400 relay team members (Pulvermacher, Germaine, Turpin), plus Josh Redfearn started the meet off by grabbing a second place finish in the 4x800 relay in a new Tri-Op record time of 8:23.52. Also advancing to the State Meet are: Senior Jeremiah Bailey who took 2nd place (6'2") and Junior Ben Davis 3rd place (6'0") in the high jump. Others who placed but didn't advance were the members of the 4x200 relay ( Bailey, Sigwarth, Germaine, Pulvermacher) 5th, 1:37.2, the 4x100 relay squad of Coffey, Shetler, Lierman, and Sigwarth finished 6th in a season's best time of 45.54, and Ben Sigwarth took 8th place in the long jump with a leap of 19' 5.5". The boys team tallied 39 points to grab sixth place behind winner, Darlington who managed to put up 76 points on the night. The 39 points scored are the most for a BSMS boy's team at a sectional meet. Together (boys and girls) this is the most events (11) ever qualifying for the state meet in the program's history. There will be sixteen athletes representing the Benton-Scales Mound-Shullsburg's track program. What a way to top off the season! The State Meet will be held at UW-LaCrosse on Fri. June 2nd and Sat. June 3rd.